2/26/2010Share this story on Facebook! School of Business professor and associate dean Hormoz Movassaghi launched the certificate program in 2000. Photo by Martha Pace '12. With “interdisciplinary” the new buzzword in the halls of academia, Ithaca College’s certificate program in international business, launched by School of Business professor and associate dean Hormoz Movassaghi in 2000, now seems prescient. 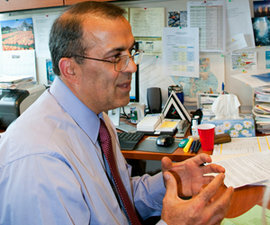 Although it’s open to students in the School of Business (except those whose concentration is international business), the program mostly attracts majors from politics, history, sociology, and modern languages who, Movassaghi says, see the value of studying business as a way to complement and enrich the training in their chosen field. Students take 15 credits each in international business, foreign languages, and area studies/international relations. With more than 150 approved courses in everything from theater arts, literature, and religion to anthropology, ethnic studies, and communications, the program offers a great deal of flexibility. “The program gives students a different path to take on graduation,” says Gladys Varona-Lacey, a professor in the modern languages department who with Movassaghi advises and directs students in the certificate program. For foreign language majors, it opens up career paths outside the traditional ones of translation and teaching. Michelle Myer ’10, a Spanish major in the program, was amazed by the possibilities it revealed. “The program opened my eyes to the endless number of occupational fields that require people with bilingual skills,” she says. With the certificate in international business, students might consider jobs with government agencies (research assistants or trade specialists with the Departments of Commerce, Treasury, or State), with private sector firms (in marketing, sales, advertising, accounting, finance, law, travel or tourism, or trade), or with international institutions (the World Bank, the United Nations, or the International Monetary Fund). International companies and organizations, Movassaghi points out, need employees trained in sociology and psychology who are sensitive to the local culture and political climate. This is one reason he hopes to expand culture and area studies from the classroom to experiential learning with the help of the Office of International Programs. One short-term study-abroad program he has his eye on: a three-week excursion to Heidelberg, Germany, where a number of global operations are centered, including Heidelberger Druckmaschinen AG, Capri Sun, and Lamy. Ultimately, Movassaghi sees the certificate in international business as fulfilling a critical role: “It encourages a more aware, more sensitive student,” he says, something you don’t always see in business.